One of my favorite recent musical discoveries (and there have been quite a few lately), Owen Pallett, aka Final Fantasy, is getting ready to start a North American tour. I will definitely be at the Boston show. His new CD, Heartland, is an amazing album from start to finish and is highly recommended. Author teenageriottvPosted on February 3, 2010 Categories Blog, NewsTags 2010, owen pallett, tourLeave a comment on Owen Pallett to tour! Bon Jovi – That’s your big headliner? The B52’s should at least be up there in a headlining spot. Richard Marx – Didn’t he die a couple of years ago? Oh wait, that was Robert Palmer. I always get those two mixed up. Kenny Chesney – The big headliner of the day. I guess I can understand this as Louisville seems more of a country kind of region and he plays to that. Michael McDonald – One of two reasons I would actually go. Gotta love What a Fool Believes! War – The second reason I would go to this festival. Dave Matthews Band – Headliner of day 3. The question here is…which festivals are they *not* playing? Zac Brown Band – Listed as another headliner…umm…who??? Steve Miller Band – Is this “let’s only have bands with the word “band” in their name” day? Kansas and 38 Special – I think these two bands tour together like, always. It’s going to be absolutely crap-tac-ular! The abundance of overweight, 40 year old women with big hair and stretch marks longer than the track at Churchill Downs. You really dig the smell of horse. I think it will be interesting to see how this festival ends up doing and hope for an even more hilarious lineup for 2011. Author teenageriottvPosted on January 3, 2010 Categories BlogTags 2010, festival, hullabalou, kentucky, louisville, musicLeave a comment on Hullabalou what?? 19 Hour Lady Gaga Fuse TV Takeover…really? So, the other night, I’m flipping through the channels and the one music channel that I can count on, lets me down with this “Lady Gaga Fuse TV Takeover”. Seriously Fuse? I mean, really?? How is it that someone that really only has 1 or 2 CD’s out can earn the right to a 19 hour takeover of a music channel? Maybe I should make some stupid auto-tuned song, put it out there, have it become huge, then maybe I can play VJ for 19 hours too! Or maybe it all just comes down to the fact that I’m having a harder time trying to figure out whether Lady Gaga is a man or a woman, than I did with Marilyn Manson and not knowing is bugging me. Author teenageriottvPosted on December 19, 2009 Categories BlogTags fuse tv, hermaphrodite, lady gagaLeave a comment on 19 Hour Lady Gaga Fuse TV Takeover…really? During my stay at the Hard Rock Hotel in Chicago, I was given two room keys, which also double as $25 gift cards to the Ticketmaster owned TicketsNow scalping service. I saw that Friendly Fires is coming to Boston in November, so what the heck, I’ll order a couple of tickets, use this card, save a little cash that could be used for beers, and be done with it. Sounds easy doesn’t it? It was not to be. You see, TicketsNow is own by Ticketmaster as a kind of legal way for them to scalp tickets at an extremely inflated price. I don’t know why it’s legal for them to do this but for some reason, it is. The image below shows the regular $15 + $5 fee (there’s a whole other topic) x 2. 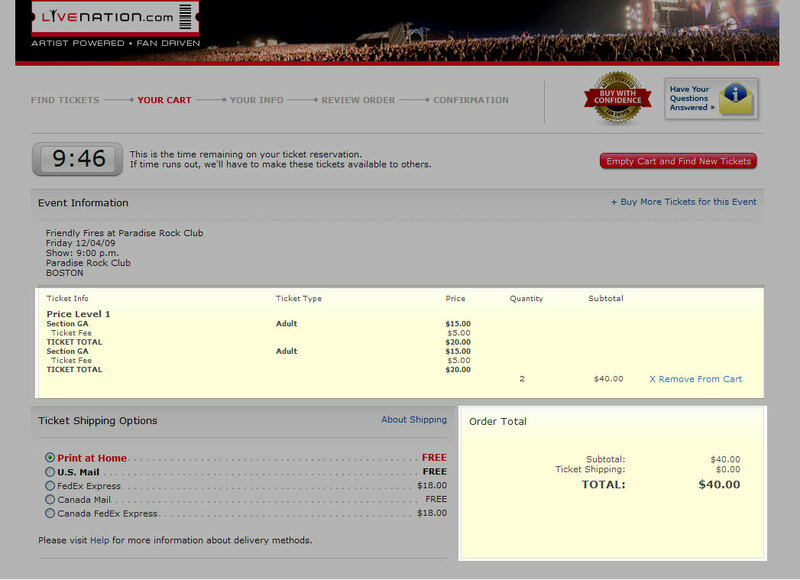 $40, no big deal to see a band I like. A similar thing happened recently when tickets for Andrew McMahon went on sale at 10am for a show in Somerville and by 10:01, it was sold out yet tons of tickets appeared on StubHub immediately (which is another one of these “legal” scalping services). Tickets for this show were going for 2-3 times the original price. It’s really sad because this show benefits the Somerville Arts at the Armory which ironically, helps out artists. Bruce Springsteen fans have also been burned by this practice. More info here. How can these companies go on ripping off their customers like that and think nothing of it? Wasn’t Congress looking into this at one point? Why didn’t Pearl Jam keep up their fight?? I miss the days of standing in line for tickets that only had a 1-2 dollar fee associated with it. Earlier this year, I attempted to get tickets for the Nine Inch Nails/Jane’s Addiction tour. I don’t recall the exact price but the fees were close to 40% of the ticket price. Needless to say, I did not go. This practice needs to stop! Someone needs to step forward, stand up to these giant corporations, and create some kind of viable alternative that does not rip off the customer. In the meantime, if the bogus fees are over a certain percentage of the ticket price, they will definitely lose my money. 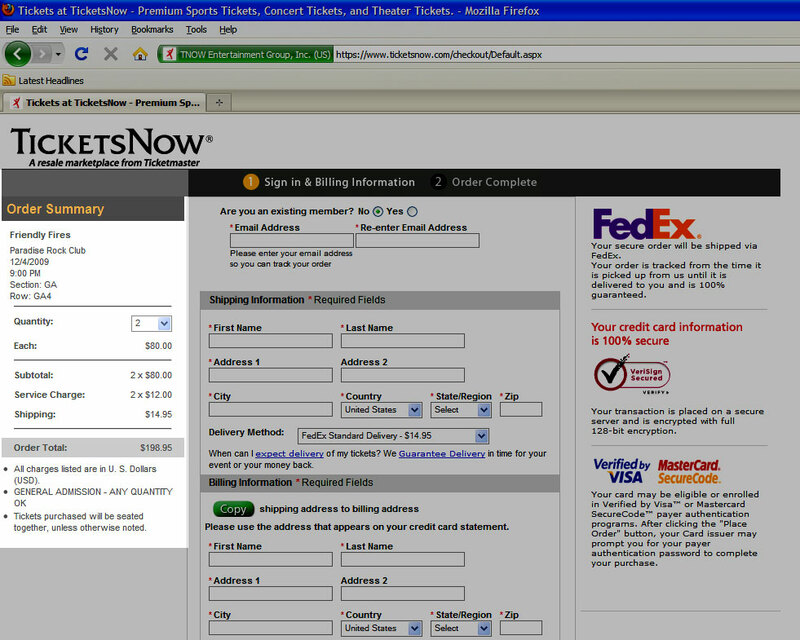 Author teenageriottvPosted on September 19, 2009 Categories BlogTags friendly fires, ripoff, scalpers, stubhub, ticketmaster, ticketsnowLeave a comment on Ticketmaster must die!! Pavement are reuniting for a 2010 tour!!! Oh yes, it’s true! Influential 90’s indie rockers Pavement are reuniting for a world tour in 2010. Presale tickets for the first announced date on Sept. 21st, 2010 (my god, that’s a long ways away!! ), go on sale tomorrow Sept. 18th 2009, with general public tickets on the 25th. Perhaps a road trip to New York is in order. Even Kanye West has to agree…oh wait, he still thinks Beyonce is the best? Damn! I’m hoping they play here in the Boston area, or at the very least, headline Lollapalooza 2010, since I will already be there. A boy can hope…right? Author teenageriottvPosted on September 17, 2009 Categories Blog, NewsTags 2010, pavement, reunion, tourLeave a comment on Pavement are reuniting for a 2010 tour!!! Congratulations to my favorite band of 2007, Matt and Kim for winning the Best Breakthrough Video award at MTV’s VMA’s last night. P.S. If you haven’t already, pick up “Grand”, it is a great CD (as is their self titled Matt and Kim CD)! It was already hot and sticky by 9:30 am when I left the Hard Rock to go find some much needed breakfast. After wandering a different part of the city for a bit and working up quite a sweat (and stopped to take my 10th shower of the weekend), I arrived for day 3 of Lollapalooza just in time to catch the last couple of songs of Friendly Fires set after getting my stages mixed up. From there I went over to the Vitamin Water stage to see Bat For Lashes, who put on an amazing show. It’s always more fun when you can tell that the artist really enjoys what they are doing and genuinely has fun performing. Natasha Kahn probably summed it up best when she said that it was hard to sing in the hot, dirty air. I just kind of wandered around, grabbed my 3rd slice of Chicago deep dish pizza of the weekend along with the countless bottle of Sweet Leaf iced tea that I may have developed an addiction to. I ended up at the Citi stage for Gang Gang Dance, who I couldn’t tell if their whole set consisted of one really really long song or if they just kept going into other songs without stopping. The big drum thing was cool though. Hippies seemed to like them but to be honest, I was a bit bored, but stuck around as I finally met up, after trying all weekend, with someone that replied to my Craigslist posting to hang out at the show as I was doing this whole weekend solo. This guy pretty much sums up the 95 degree heat for the day. After they were done, we parted ways and I went down to watch Vampire Weekend for a little bit. They were pretty much what I expected and sounded the same as on their CD. From here it was off to the Citi stage see a band from my current hometown of Boston, Passion Pit. I really expected more from them, but every song sounded exactly the same. They drew a huge crowd to the slightly smaller stage though. I grabbed yet another Sweet Leaf iced tea and walked across the field to watch Cold War Kids from a very far distance. The crowd over here was huge and there was no way in hell I was going to try to squeeze through it, so I chilled out on the stairs for a while! I’m thinking that the large crowd was due to the fact that Snoop Dogg was going on next at the stage across from this one. Once it got closer to 6:30, I made my way down to the Chicago 2016 stage to catch his set. A quick aside…there was this bare area of dirt down there that felt like someone had turned on an air conditioner. It was a few minutes of heaven on an extremely hot day. I’m sure there is a scientific reason for this strange little phenomenon, but I’ll take it without questioning it (my bet is the lack of people in this one spot so the air could actually flow). I sat on one of the smaller hills until Snoop came out, then went down towards the left side of the stage for a better view. It was pretty repetitive with lots of “wave your hands in the air” and “come on Illi-NOISSSSE!”. Snoop Dogg working the crowd. The crowd was massive for Snoop Dogg! He had a pretty funky microphone all blinged out. This was probably one of the largest crowds at any of the stages I had seen so far this weekend. I took a quick walk to the other side of the park, catching some of Deer Hunter, before moving on to the Budweiser stage to see a bit of Lou Reed for no other reason than to see him. This didn’t work out too well as it was kind of hard to get through the crowd over there, and I couldn’t get into whatever song he was playing. Back to the south side. Made a quick stop at Perry’s tent to see a bit of MSTRKRFT, who were awesome, but I really wanted to get back in time to see Silversun Pickups, who were one of the bands I had really looked forward to seeing. This was my first time seeing Silversun Pickups live and they did not disappoint. They played as the sun was setting, which made for a nice ambience. This ranked as one of the best sets I saw all weekend. Since I’m not a fan of The Killers (thanks Dane Cook for having Hot Fuss played on repeat for about 3 hours straight when you did your HBO taping at the Boston Garden before you came on stage! ), I started to go over to the Budweiser stage for Jane’s Addiction, but Band of Horses were still playing on the Playstation stage. This stage is directly across from the Budweiser stage, which means that 2 bands should not be playing at the same time but that’s exactly what happened. Band of Horses makes people climb poles. The apparently self important Band of Horses, who must think they are soo much better than Jane’s Addiction, continued to play even as Jane’s took the stage, played a song I could not hear, then went into Mountain Song, which I only knew because of the bass line but nobody could really hear because the asses on the Playstation stage kept playing. Then they played another song. Then another. The crowd around me began to yell for them to stop playing so we could hear Perry and the rest of Jane’s! Finally… Band of Horses stopped and we could hear Jane’s Addiction who were absolutely amazing! I got up and tried to figure out how to fit everything back into the suitcase, then was off to find the blue line back to O’hare, which I failed at. A stop into Cosi to ask for directions, pointed me to where I needed to go and I was on my way to the airport. I was sad to leave the festival and Chicago, for that matter. Overall, I had an amazing albeit fast 4 days and will have to return very soon just to do some sightseeing. Thank you to everyone at Lollapalooza, the Hard Rock Hotel Chicago, Jetblue, for making my first trip to Chicago awesome! I will most definitely be back in 48 weeks! See you then, Chicago! Stay classy!